The State House and the Office of the Secretary to Government of the Federation are under fire over alleged budget misappropriation for 2013 fiscal year. 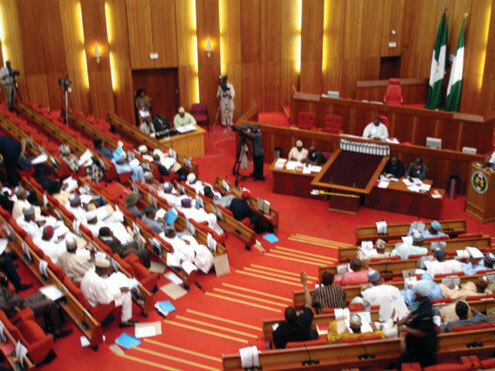 A N3.305billion budget on welfare package, meals, repatriation and sitting allowances presented before the Senate Committee on Federal Character and Inter-governmental Affairs was greeted with skepticism on Tuesday, November 20. The State House and the Office of the SGF were unsuccessful in convincing the committee on the rationale for the large amounts budgeted for the items which included N203.75million allocated for refreshment and meals, N107.4m for honorarium and sitting allowances while publicity and advertisement stood at N37.3m. Other miscellaneous spending included medical expenses, N50.3m; postage and courier services, N10m; welfare packages, N195m; subscription to professional bodies, N4.58m; and sporting activities, N32.91m. Then there was the added list of overtime work bugeted at N250.45m; feeding of animals including animal supplements for the veterinary clinic, N30.58m; Summit/Extra ordinary sessions including the UN, African Union, ECOWAS, etc, N228.11m; and NYSC, IT, LOCUM, housemanship and contract staff allowance, N144.78m. The ‘extravagant’ budget estimates received questioning because while the State House voted N1.305billion for the items, the Office of the SGF voted about N2billion for similar items in the budget. Permanent secretary of the State House, Emmanuel Ogbile, however, stunned members of the committee when he said the N1.305bn budgeted for refreshment and meals and other miscellaneous expenses for the 2013 fiscal year was not enough. The total budget for the State House for the 2013 fiscal year is N14.715bn and the State House officials were present to defend it. Senator Isa Galaudu, a member of the committee had raised the observation that the State House was spending too much for the items listed and wondered why it was so. He noted that what Nigeria spent in one year was what South Africa spent in five years, demanding that the permanent secretary should give proper explanations for the allocations. According to him, other expenses that are taken care of in the refreshment and meals vote include National Economic Council, Council of States, conferences in the Banquet Hall, Presidential retreats, National Merit Award, Children’s Day, hosting of dignitaries. Chairman of the committee, Senator Dahiru Awaisu Kuta, faulted Ogbile’s claims on the grounds that the Merit Award had its own budget for such ceremony . The committee also found outrageous, the votes of the Office of the Secretary to the Government of the Federation for welfare packages, sitting allowance and repatriation allowances.